Ah, the veggie burger. Some restaurants have decent ones. Some are mushy and some taste like warmed-over hockey pucks. (Not that we eat a lot of hockey pucks, mind you.). What if you could have a veggie burger that looks and tastes so close to meat that you might not even know the difference? That’s what the folks at Impossible Foods promise for today’s Impossible Burger tasting. Date Night pulls up a chair and investigates. We are at Grindhouse Killer Burgers in Decatur. Well, half of us is here. The cute one plays mah jong on Tuesdays, so I am on my own. Some bloggers and newspaper writers have been invited to try the burgers and learn about how they are made. Also present is Impossible Foods COO David Lee, who has jetted in from the west coast to answer our questions. Lee explains that there are only four main ingredients to the Impossible Burger. Wheat protein is the body of the burger. Coconut oil makes it juicy. Potato starch allows you to get the crust on the burger when you grill it. The secret ingredient is something called heme (rhymes with “seem”), which makes the burger taste like meat. Grindhouse owner Alex Brounstein is also here. 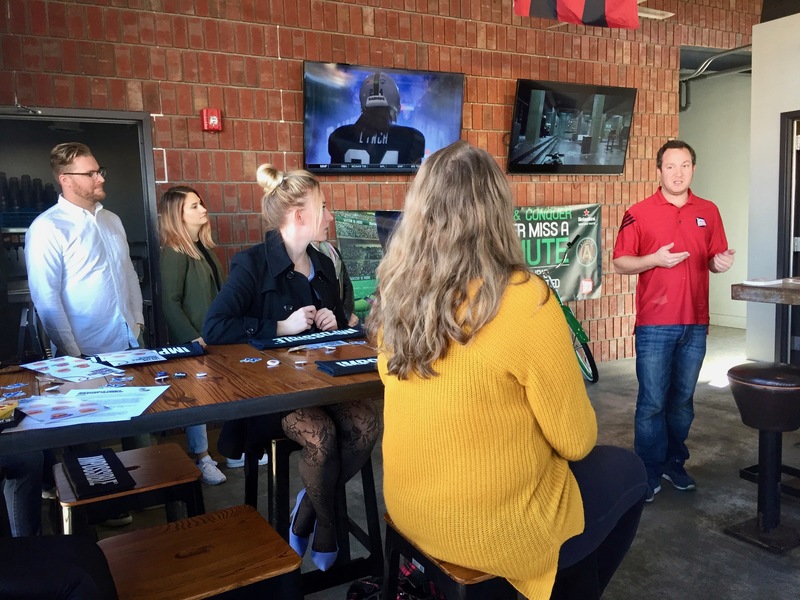 Brounstein (in the red shirt), who has taken Grindhouse from a stall in the Atlanta Municipal Market to a five-location “mini-chain”, tells us that they cook the burger just like meat. 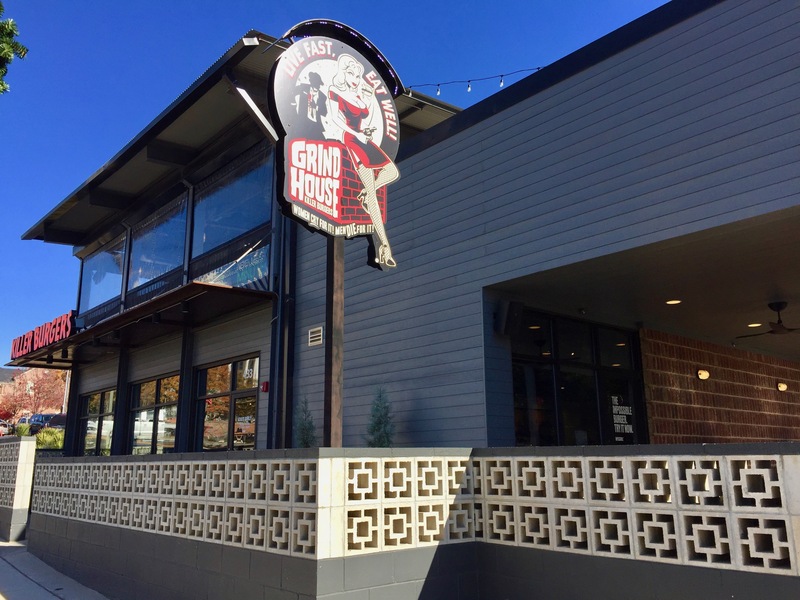 About half of the veggie burgers sold at Grindhouse are now the Impossible Burger. 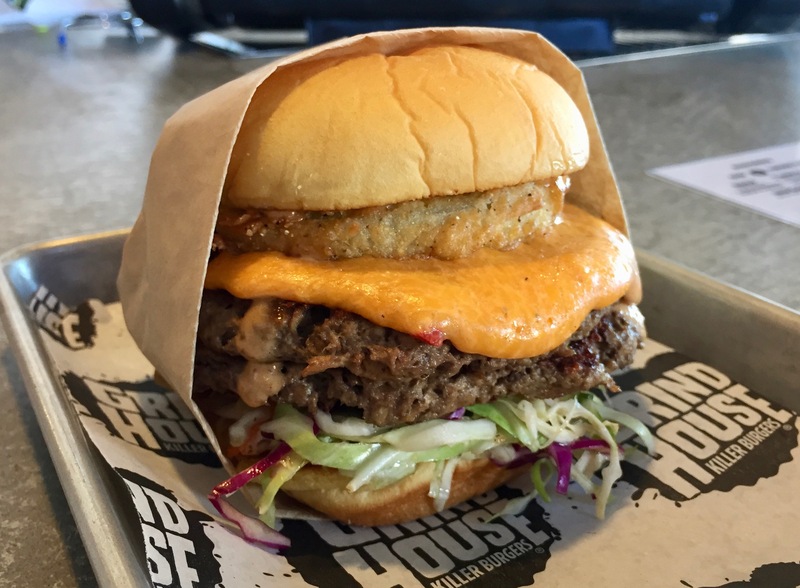 Right now, Grindhouse is one of the only places in Georgia where you can get this burger. You will see it at other local restaurants in the future. Well, if I told you that was meat in that bun, you would probably believe me from the visual perspective. This is the “Dixie Style” burger with fried green tomato, slaw and pimiento cheese. So it looks like a burger. It also has the texture of meat. No soggy bean burger here. But most importantly, does it taste like a burger? Well, it’s close. With all of the pimiento cheese, ranch dressing and slaw on the burger, it’s hard to taste just the “meat”. If someone put this burger in front of you and told you it was made with beef, you would believe that too. I wish that Grindhouse had brought out one of their beef burgers so that we could have compared. When you taste the patty by itself, it doesn’t taste exactly like meat, and here’s where you realize that no cows were used in its preparation. And that’s not a bad thing as it uses 75% less water and requires 95% less land to make Impossible Burgers compared with beef burgers. And when you learn that half of the USA beef production goes to restaurants, imagine how much greener the world would be if people ate these even ten percent of the time. OK, enough tree hugging. 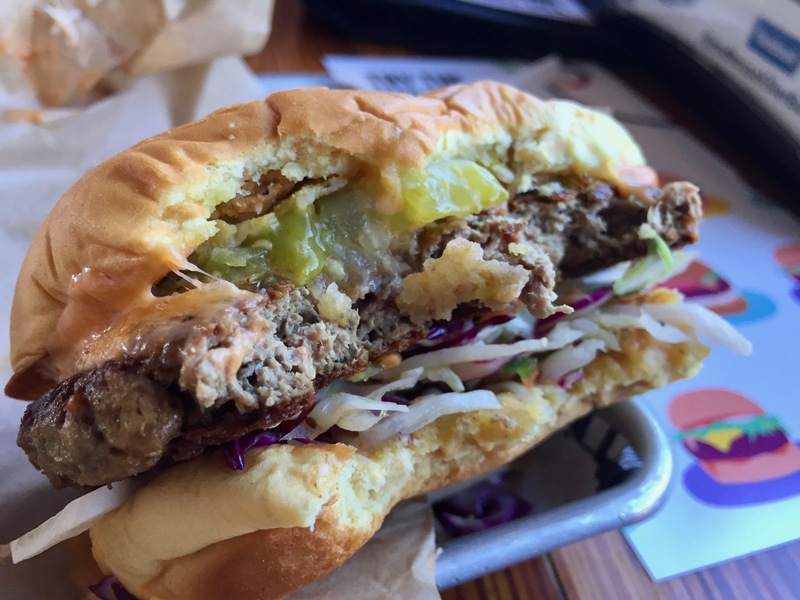 Is the Impossible Burger the best burger I have ever had? No, but it is the best veggie burger I have ever had. It’s close to a “real” burger, but in my mind, there’s nothing like a thick, juicy, sloppy burger, that runs all over your hands and face. Of course, this is a lot better for you than that sloppy burger I just described. Try one and let us know what you think. 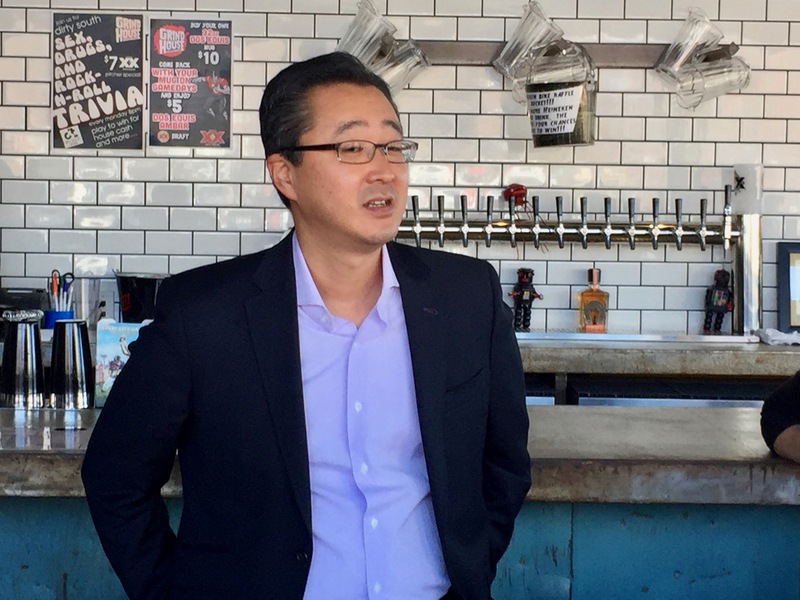 As COO Lee says, his company is out to change the world, “one burger at a time.” They just might do it. Disclosure time: As this was a media event, Date Night did not pay for the Impossible Burger at Grindhouse. Our words, however, are priceless. Thanks to the Impossible Foods gang for the invite and to the Grindhouse staff for doing such a nice job with this event. Yay! Welcome to my world! You can get one at Jayne’s Gastropub San Diego the next time you are down there, NVN!